Economists at UBS Group AG , Nomura Securities and Oxford Economics in the past week raised their projections for rate increases, joining other prominent forecasting shops that had already projected four quarter-percentage-point increases in the Fed’s benchmark short-term interest rate this year. What’s wrong with deficit-led growth pushing up interest rates a bit? History, for one thing. Note how a rising Fed Funds rate preceded every recession in living memory. AND that the point at which higher short-term rates kicked the economy into reverse has been lower in each post-1980 cycle. So it’s reasonable to assume that in the current hyper-leveraged system it won’t take much higher rates to produce instability. 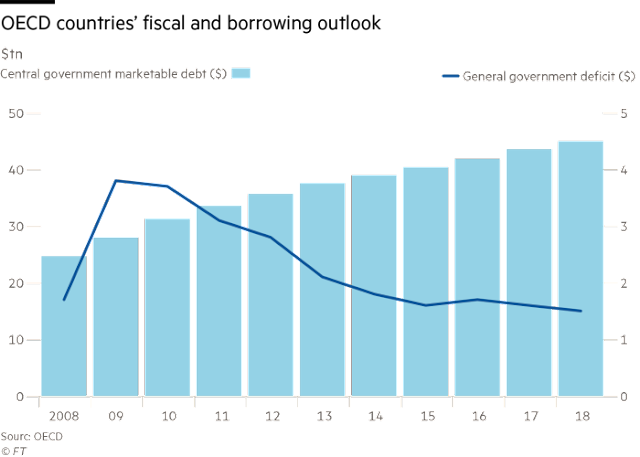 Developed nations face a rising tide of government debt that poses “a significant challenge” to budgets as interest rates increase around the world, the OECD has warned. 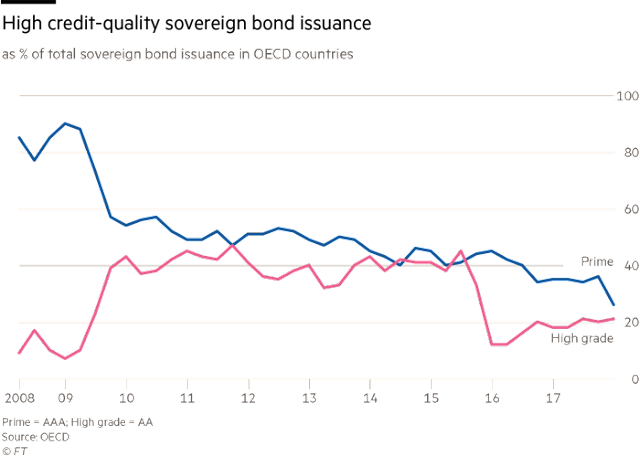 Low interest rates have helped sustain high levels of government debt and persistent budget deficits since the financial crisis, according to the OECD, but the “relatively favourable” sovereign funding environment “may not be a permanent feature of financial markets”. Fatos Koc, senior policy analyst at the OECD, cautioned that most members of the organisation — sometimes dubbed the rich nations’ club — confront an “increasing refinancing burden from maturing debt, combined with continued budget deficits”. In an Economic Outlook, published at that time, the Paris-based organisation said that “even a lasting increase in 10-year government bond yields of 1 percentage point . . . might worsen budget balances on average by only between 0.1 per cent and 0.3 per cent of GDP annually in the following three years”. But Ms Koc now argues that the wisdom of using fiscal measures as economic stimulus depends on an individual country’s budget position, and that it is “important to create strong fiscal roots in an economy while times are good”. The total stock of OECD countries’ sovereign debt has increased from $25tn in 2008 to more than $45tn this year. Debt to GDP ratios across the OECD averaged 73 per cent last year, and its members are set to borrow £10.5tn from the markets this year. Because much of the debt raised in the aftermath of the financial crisis is set to mature in the coming years, developed nations will have to refinance 40 per cent of their total debt stock in the next three years, the OECD said. 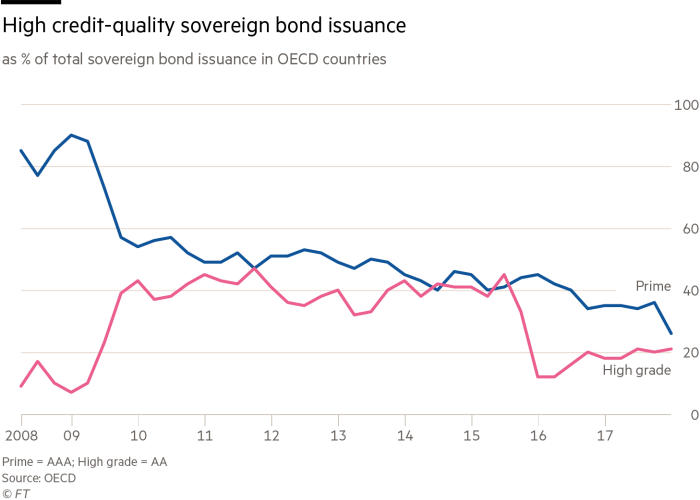 Many countries’ credit ratings have fallen as their debt levels have risen over the past decade, diminishing the attractiveness of some sovereign debt for investors looking for high-quality credit. 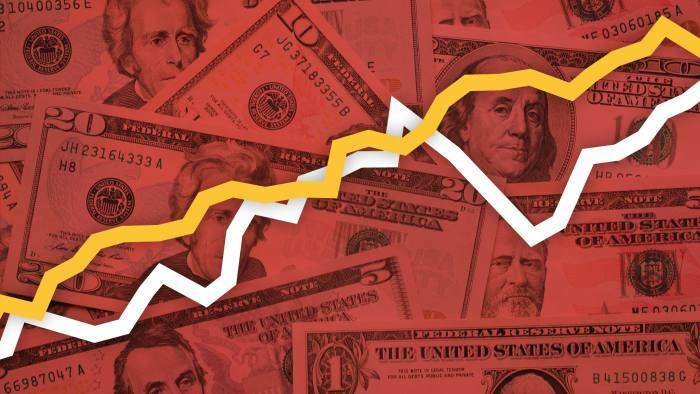 The global economy is experiencing a co-ordinated upswing in growth and policymakers are gradually unwinding the unprecedented monetary policy measures they implemented after the financial crisis. As central banks’ holdings of government debt reduce and interest rates begin to rise, bond yields have started to shift upwards. OECD countries are implementing some precautionary measures to cope with such concerns, the research noted, including increasing the amount of long-dated debt they issue so as to reduce their refinancing requirements in any one year. Chinese fleet, composed of ships vastly superior to those of Europe, ventured as far as Africa. Since dropping the ball on world conquest back then, or at least exporting their culture wholesale, they’ve been in stasis, and on the receiving end of what Europe had to dish out. That’s what Doug Casey often says. And it’s part of the reason I put my boots on the ground in China a few months ago. As I told you yesterday, the country has a monopoly on a little-known resource market. For years, stocks in this sector only went down. The industry was left for dead… until recently. The last time this happened, the price of this resource skyrocketed over 10 times almost overnight. Most people have never heard of the material China controls. But it’s essential to modern life. It’s used to make crucial components for advanced electronics like iPhones, electric cars, flat-screen TVs, computers, and sophisticated military equipment—like guidance systems, drones, anti-missile systems, radars, and fighter jets. The United States’ top-line fighter jet, the F-35, contains nearly 450 kilograms of this material. There’s no substitute for this resource in these advanced electronics. The US military and US consumer depend on it. The problem is that finding this material isn’t cheap. And once you find it, mining it is expensive and messy. It takes about 40 tonnes of rock (40,000 kilograms) to get only about 250 kilograms of this valuable material. The costs are even higher if you separate the material from the ore in an environmentally friendly way. But China is willing to do the dirty work. Beijing helps by subsidizing the industry. Meanwhile, many companies in other countries—operating without hefty state subsidies—go bankrupt. Plus, China doesn’t fret about the environmental fallout as much as other countries. This lets it produce the material at a much lower cost than its competitors. Until recently, one company in the US still produced a small amount of this material. Then, after a spat with a neighboring country, China flooded the market with supply. This oversupply drove the last US company out of business. [China] flooded the market by more than tripling the previous world supply of the materials. During this time, [Chinese firms] were largely unprofitable but were allowed to survive through direct and indirect support by the Chinese government. Mines in the United States and elsewhere, unable to remain profitable against cheap Chinese exports, went out of business. This is how China undercut everyone else and came to dominate the industry. 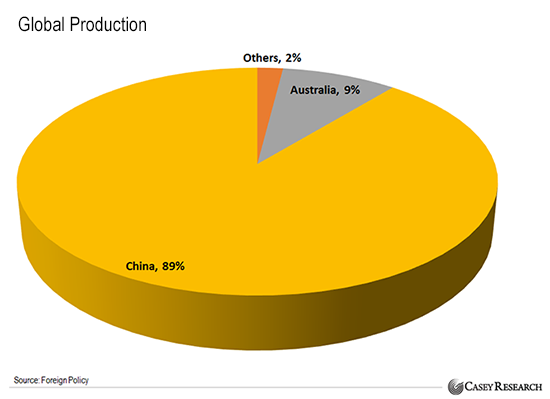 Today, China produces around 90% of global supplies of this material. In short, no one poses a serious threat to China’s monopoly. China can simply hold prices lower for longer than any competitor can stay solvent. Regular readers know I think a full-blown trade war between the US and China is imminent. And we’ve already heard the opening shot. Early on in his presidency, Donald Trump indicated that he wouldn’t handle China like the previous US presidents. In January 2017, he became the first president in 40 years to speak with the leader of Taiwan, an island off the coast of China that Beijing considers a renegade province. Even during the campaign, Trump famously threatened a 45% tariff on Chinese goods entering the US. Getting tough with China on trade is a campaign promise Trump can actually keep. He doesn’t need anyone’s cooperation. Legally, he can implement the necessary policies on his own. And last summer, Trump fired the first shot in the trade war. His administration launched an investigation against China using Section 301 of the Trade Act of 1974. The Chinese considered this a provocative move. Since the World Trade Organization (WTO) was founded in 1995, member countries—including China and the US—have traditionally settled trade disputes through it. But Trump, using the Section 301 investigation, is taking a one-sided approach. As I mentioned yesterday, China has a big card to play now. It could easily restrict supplies of the special material again. That would bring any country—including the US—to its knees. This isn’t some wild speculation. Remember, China didn’t hesitate to restrict supplies in the past. Plus, if it restricts supplies again, I think the WTO will give its blessing. That’s because China’s move would probably be in response to one-sided US trade penalties—something Trump has already shown he’s willing to implement. There’s no way around it. The Chinese are ready to use their monopoly in this market. It’s their ultimate weapon in the trade war with the US. The good news for investors is that we can use this crisis to make huge profits. Prices of this special resource are still near their lows for this cycle. 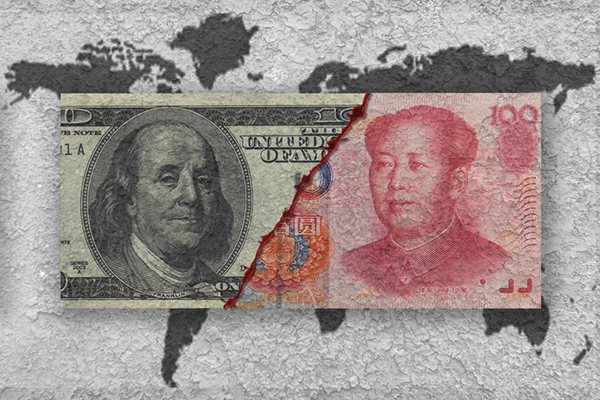 So before tensions between Washington and Beijing escalate further, we can buy a dollar’s worth of assets for a dime or less. This way, we’ll be positioned to profit before the war heats up and the next mania kicks in.